When two lovers pass through the Callejon del Beso, the Alley of the Kiss, they must kiss on the third step in order for their love to last forever. That’s why hundreds of people who pass through this narrow place don’t hesitate to do so and hope that the story turns out to be true. 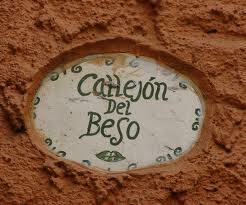 Callejon del Beso is a beautiful place, located about 360 km from Mexico DF, in the city of Guanajuato. Legend has it that the beautiful young Doña Carmen was the only daughter of a greedy and uncompromising father. Like many parents of that time, he looked for a rich and powerful suitor to give the hand of his daughter in holy matrimony. Therefore, he jealously watched her every move to prevent her from meeting the common and ordinary men in the poor mining town. Just thinking that his beautiful daughter could fall in love with a poor villager filled him with anxiety. But as it very often happens, love breaks down all barriers, however strong they may be. Doña Carmen met Don Luis, a poor miner whom she would meet at a church near her home, unbeknownst to her father. One fatefull day she was discovered when the young miner was courting the beautiful maiden by offering her holy water from his hands. Furious her father locked her away at home and threatened to marry her to a rich old Spanish nobleman. This way he would “hit two birds with the same stick”…he would marry his daughter and increase his depleted fortune at the same time. The beautiful and submissive girl sadly lived her confinement next to her beloved lady in waiting, Doña Brigida. Every day from the balcony of her bedroom, both lamented over her distress and Doña Brigida did nothing but promise never to allow her to be taken to Spain against her will. At first, the young lover didn’t know what to do since he was not allowed to talk to his beloved, but passing near her house, he noticed that her bedroom window faced exactly toward the window of the house next door and that they were scarcely a few inches apart. This gave him the possibility of staying in touch with his beloved if he bought the house next door. He offered a good price to buy the house from the owner, but received constant negatives. Finally exasperated by the young man the owner set an extremely high price hoping to disuade him. Nothing would deter the young man and in order to purchase the house he had to dispose of all his life’s savings in exchange. However high the price, it was well worth it, for when he looked out the window he discovered that by extending his hand he could touch his beloved’s bedroom window with his knuckles. 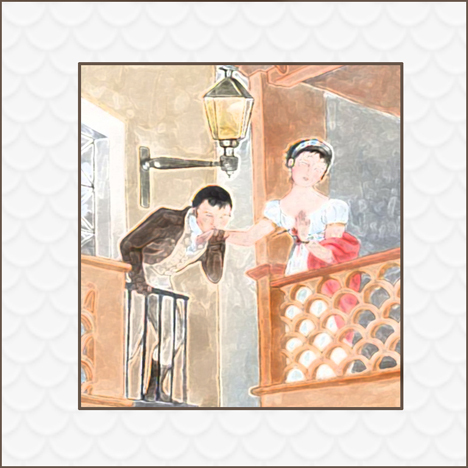 Doña Carmen’s surprise was also great when, leaning over her balcony; she found the man of her dreams at such a short distance. They swore eternal love and saw each other nightly from the adjacent balconies. One evening while the lovers– wrapped in a passionate kiss– were distracted, violent words were heard from outside the bedroom. It was Doña Carmen’s father– scolding Brigida, who was risking her life trying to prevent her master from entering her mistress’ room. The father pushed Doña Brigida away. When he saw his daughter kissing the miserable miner, he took a dagger and in a single stroke, drove it into his daughter’s chest– full of anger and rage. Don Luis was in shock and with horror he felt Doña Carmen‘s hand, still in his, getting cold and motionless. The young man could not bear to live without his beloved Carmen and in desperation committed suicide by jumping from the wall of the main shaft of La Mina de la Valenciana, The Valentian Mine. Callejon del Beso still exists in the beautiful city of Guanajuato; it’s located in the historic area in the foothills of Cerro del Gallo, a town that has existed since the 18th Century and is without a doubt one of the most famous streets of the city. This alley has the peculiarity of measuring only 27 inches wide and its balconies are almost joined to each other, at a fateful distance of “just a kiss”.